No one wants to deal with stains. You work hard to remove the stains on your clothes. You try to figure out how to prevent getting more stains. You may want to take that approach when it comes to stains on your teeth. Learning how tea stains your teeth can help you prevent it and also help you find a way to keep your teeth whiter. Most people know that coffee can stain the teeth. Coffee is dark and that makes people think it is more likely to stain the teeth than tea is. Tea is actually more likely to stain the teeth than coffee is. This is because tea has a higher tannin concentration. It is the tannin that stains the teeth. Part of the reason that anything can stain the teeth is because of the structure of the teeth. Although the teeth look like they are completely solid, the enamel of the tooth is actually porous. The enamel of the teeth absorbs the tannins in the tea. Some of this is caught in the teeth and that is what leads to the stains. While it is possible for tea to stain the teeth, that does not mean it has to happen. There are things you can do to prevent the tea from discoloring your smile. The first thing is to realize that the stronger the tea is, the more ability it has to stain the teeth. 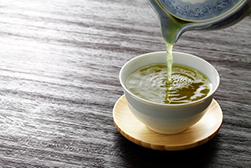 Green tea contains more tannins than most teas. This makes it more likely to stain the teeth. Besides limiting the amount of tea and considering the type of tea, there are a few simple things you can do to reduce or prevent the staining. The easiest thing to do is brush your teeth. Twice a day can help remove stains from anything. Brushing right after drinking tea can help more. It is also a good idea to follow a glass of tea with a cup of water. The water can help remove some of the tannins that lead to the stain. To keep a healthy, white smile, you need to know what can cause discoloration. If you want to learn more, contact the professionals at our offices and ask any questions you have.